Discussion in 'General Airgun Chat' started by Adam, Feb 14, 2019. Right lads we need to sort this new bullpup PCP. It needs a fully shrouded barrel and a full length rail. Boss, I found this box section in the skip? Good job, screw the rail to it and spray it black, job done! @RobF Ech! Yes I'd forgotten about that one, a strong contender indeed. It's the grip and trigger guard that's most offensive to aesthetic sensibilities. I think the Benjamin abomination shades it though! Both of them ain't got no alibi they is ugly. Got to say though you wouldn't need to give them much wind at that power, I had a interesting 30 minuets looking at some of the guns, the pellets are almost as big as a mini kill ??? I don't care how much of a bargain they are etc. They are one fugly rifle! Proving that an owner does indeed take after his gun, I'd like to propose our Rock Hero for this dubious accolade. berty177, Darron and RAMBO like this. Aw, I quite like that. Lol! I know what you mean. It’s got something, a bit of a sci-fi pulse rifle vibe. And at least they made an effort with the shroud and put those cutouts in to add some visual interest. 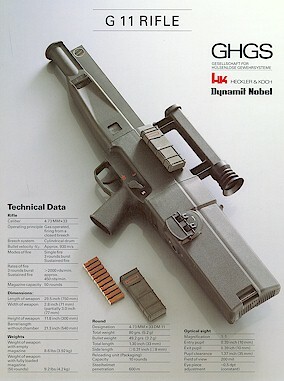 This isn't an airgun, but I was familiar with this in the late 80's, working in Germany for a short while. It was one of the more interesting things around the place. Being supposedly the new Nato weapon, looks weren't part of it's brief. But it shows you how old some designs are even though some may think otherwise. Fascinating machine: caseless ammo, 3 round bursts at an insane cyclic rate while the whole action recoils back on rails inside the plastic stock, like a full-auto TX200SR! Can I get some of that too? I think I want one! Are you all sharing Holly's eyes? What's wrong with you all? Erm, Martin... don't you shoot a FWB 800? Glass houses and all that.